Beaux Arts. Designed by Frye and Chesterman and built between 1905 and 1908 in the monumental Beaux Arts style, was an important addition to the city's literary and educational life, although it functioned as a private library for public use for most of its history. Reflecting its benefactor's hopes that it be an "temple of learning", the library featured elaborate stained-glass windows, representing the "9 grand devisions of human expression". Planned for a capacity of 50,000 books, it also contained children's rooms, open and closed stacks, as well as periodical and magazine rooms. The series of steps and terraces was designed by Boston landscape architect Bremer Pond and was added in 1924. 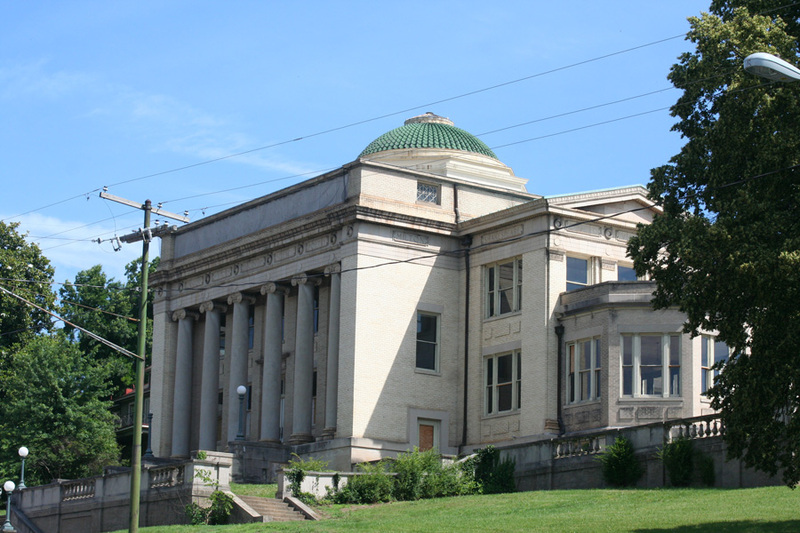 The Jones Memorial Library is listed on the National Register of Historic Places. The library was a gift to Lynchburg from Mrs. George M. Jones in memory of her husband. Originally, there was a bronze statue of George Morgan Jones on a landing. This statue is no longer there, but an identical one stands at Randolph College today. This statue shows Jones in the uniform of a Confederate general, although he actually served as a cook in that army. Jones was an industrialist and philanthropist. He was instrumental in the establishment of Randolph-Macon Woman's College. Jones was also an organizer of the Rivermont Company that planned the, then, new community along the avenue. The library stands near the second mansion built by the Joneses at 456 Rivermont. The Jones Library moved in the 1970s and the building was used by the Patrick Henry Institute. The current Jones LIbrary opened in 1987 at 2311 Memorial Av where it specializes in Lynchburg and Virginia genealogy and history. The building on Rivermont is currently empty. For multiple images of the Jones Library, click on the Interview with Flo Traywick on June 11, 2010: The Jones Memorial Library offered reading programs to children. There was a statue of General Jones on the terrace. Mrs. Jones would try and rearrange the books by color.